We have been considering the changing spaces of text and text technologies, and the impact this has had on teaching, learning and communication. In Bolter (2009) the author discusses “the breakout of the visual” (p.47), and originally this paper was to look at the possible increases in accessibility that a heavier reliance on visual elements over text might bring. The problem with that is that visual elements have a culturally constrained language, just as much as text. At a very basic level, some elementary functions of web pages, like navigation buttons, are based on Western symbols, and text direction can be right-to-left, or top-to-bottom. As an example, help buttons are often circles with a question mark. If your script uses a different mark to indicate a question, you would have to learn the convention that “?” indicates the help menu. So if graphics and visuals are not going to be the tools which localize content and access to the Internet, is there an equality of text on the WWW? Is this important? Is English really the dominant language of online text, and if it is, is this a major barrier to access for the large percentage of the population who are not literate in it? How is the English and Roman alphabet history of computing languages influencing the form and function of the Internet today? Is it possible that without invasion, or even physical contact, English-language communities will come to re-colonize the non-English literate societies by replacing local languages and scripts (Djite, 2008)? Is the legacy of the English-dominated origins of the Internet possible to overcome? In the concept map that accompanies this paper, we examine two main points. First, that the development of text on the Internet and digital text in general, follows the same path as the development of movable type by Johannes Gutenberg. Both technologies began by utilising Western and European languages, but movable type is now able to represent almost any script used by humans. Is it now possible to represent non-English and non-Roman scripts in digital text? Second, if there is evidence that the dominant language of the internet, originally English, is being challenged by other scripts and languages, and in particular by non-Roman scripts, then we may tentatively conclude that the language path of the Internet will follow the same route as movable type and become more accessible internationally. 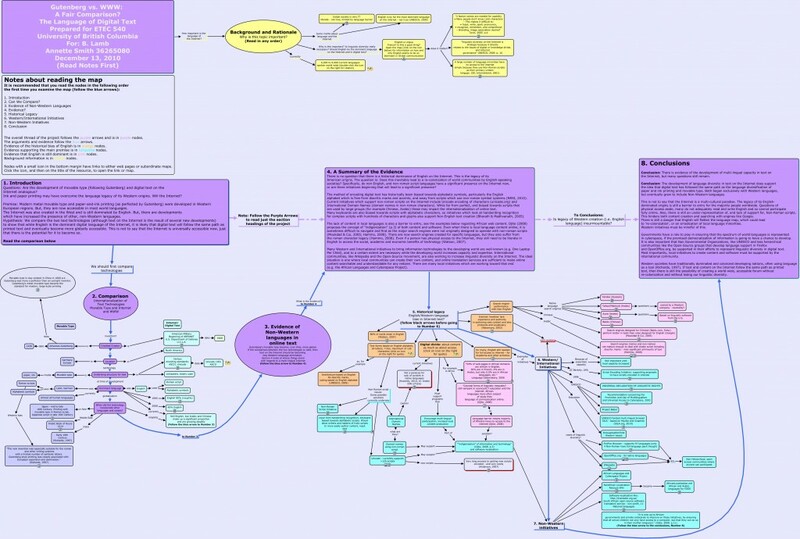 The main body of this paper has been represented in a concept map, using Cmap Tools software from the Institute for Human and Machine Cognition. Cmap Tools allow for the building of collaborative concept maps and a spatial representation of ideas and thoughts. Please look at the concept map for an elaboration of the main argument (link to a web-based version of the map is below). When you first look at the map it is best to follow the blue arrows which indicate the most linear path through the information. As English is my first language, the map was created with a distinct left-to-right, top-to-bed bias. The main summaries of the argument are in purple nodes joined by purple arrows. The diagram below gives an overview of the main sections of the map; the web version will be full sized. Nodes which have an annotation or a web link have a small icon in the lower margin of the node (see diagram below). Clicking on the icon will bring up the title of the resource and clicking on the title will open the web page, image or file. Bolter, D. J. (2009). Writing Space: Computers, Hypertext and the Remediation of Print (2nd Ed). New York: Routledge. This entry was posted in Major Project, Text and tagged language, localization, text. Bookmark the permalink.